ELMER W. DENNY. 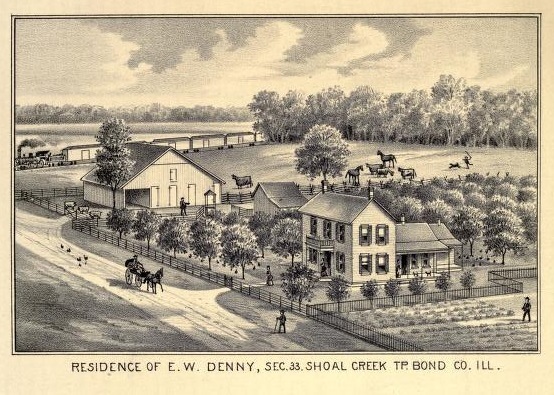 It is probable that the gentleman of whom we write has an experience extending over as many years in this particular locality as almost anyone in the county, for he was born in Shoal Creek Township, Bond County, September 18, 1836. He is a son of James E. and Mary P. (White) Denny. The father was a native of North Carolina, born in 1796, and in 1823 he married Mary P. White, also a native of that State. The two families had emigrated to Illinois in 1819, although the White family settled in Madison County. James Denny died in 1843 and his wife passed away while still on the old homestead, December 2, 1883. Mr. Denny was one of twins who were next to the youngest of a family of eight children. Franklin S. was born in October, 1825, and lives at Springfield, Mo. John W. was born June 18, 1828, and went to California with the memorable '49ers. He there made a permanent residence and died January 18, 1878. Oliver C., who was born April 30, 1830, and served for three years in the late war, now owns the old homestead; James E., who was born June 12, 1832, is a wealthy mine owner and politician in California; Juda A., who was born November 4, 1834, married John N. Prickett and died December 29, 1883, leaving two children, William S. and Addie. Our subject's twin brother, Theron L., died in the army October 4, 1861. William H., who was born April 26, 1842, is a farmer in Southwestern Kansas. The father of this family was a man of considerable education for an early day, and was more or less engaged as a teacher. In 1871, our subject purchased two hundred and sixty acres of land which adjoins the old homestead and has since bent his energies to its cultivation. Most of his attention is given to the stock business, which he finds very profitable, as there is not so much liability of loss from conditions of weather and similar causes. Our subject was married January 26, 1868, to Miss Ann Finley, who, like himself, was born in this county. Their children are as follows: Ledger Theron, born April 16, 1869, is now a business man of Sorento; Elmer Walter, born July 3, 1871, has just completed his education and is at present at home; Anna S., born July 25, 1873; George O., January 5, 1876; Cordelia Jane, February 2, 1878; and William Chalmer, March 26, 1881. Extracted 21 Dec 2016 by Norma Hass from 1892 Portrait and Biographical Record of Montgomery and Bond Counties, Illinois, pages 480-481.